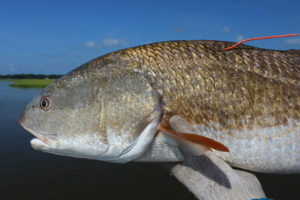 CHARLESTON, S.C. – Red drum, redfish, spottail, channel bass – South Carolina’s most popular saltwater gamefish goes by many names and plays a key role in the coastal economy and ecosystems. In recent years, state biologists have documented a declining trend in the state’s red drum population, which has been underscored by reports from longtime local anglers. These concerns prompted the South Carolina Department of Natural Resources (SCDNR) to take a closer look at the species last year, culminating in an assessment that found South Carolina’s red drum population was experiencing overfishing. The South Carolina General Assembly responded by passing a new law intended to reverse overfishing, which Governor Henry McMaster recently signed. The new catch limit allows two fish per person per day and no more than six fish per boat per day, effective July 1, 2018. 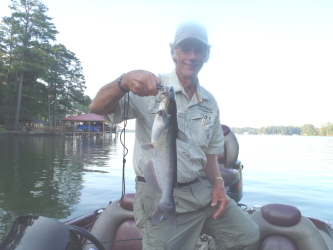 The previous catch limit was three fish per person per day, with no boat limit. The slot limit (15-23 inches) remains unchanged. Red drum are renowned for their beautiful copper color and characteristic black tail spots. Red drum reach several feet in length and can be found in all of South Carolina’s coastal waters at different stages of their lives. SCDNR research has shown that the fish reach maturity around four years of age, although adults may live to 40 years old. A healthy population of these adult red drum is critical to the success of the fishery, as the larger a fish is, the greater its contribution of spawn to the next generation of young fish. Adult red drum spawn in the fall, producing an annual “crop” of new fish. Recently, the crop has been relatively small. Young red drum (1-4 years old), which make up the foundation of fishing in South Carolina’s creeks and rivers, have not been plentiful over the last decade. Research at SCDNR shows that poor reproductive years are not necessarily unusual for these long-lived species – Ballenger notes that large crops of red drum fish are only produced about twice a decade. However, Ballenger’s team has also discovered that not as many red drum are surviving from one year to the next as in previous generations. The reasons for this poor survival are unclear, but the impact has translated into fewer fish within the slot size limit, which is ultimately expected to mean fewer adult fish annually entering the spawning population. At the same time these ecological fluctuations have occurred, fishing pressure has increased in South Carolina, especially on large adult fish. Adult red drum are already protected from harvest in South Carolina. Under current legislation, the fish are only legal to harvest when they fall between 15-23 inches in length – a size range that they reach for a little more than a year of their life. As a result, the red drum fishery in South Carolina is defined by catch and release – 80% of red drum caught by anglers are released. But even under ideal conditions, studies estimate that 8-16% of caught-and-released fish die after release. Minimizing the death of released adult fish is critical to maintaining good fishing. The red drum from South Carolina to Florida are managed as a single population, and the status of regional management is currently unclear. This left SCDNR staff with questions about the status of the species in South Carolina, given the declines seen in catch rates of young fish. The agency therefore initiated an assessment of red drum just in South Carolina to better understand the health of this important species in local waters. The assessment determined that with a three fish per person per day bag limit, not enough red drum are surviving to sustain the population over the long-term. The study also found that a modest shift in regulations – from three to two fish per person per day – would be enough, in time, to improve the number of fish recruiting into the adult population. Companion bills codifying new catch limits (two fish per person per day and six fish per boat per day) were introduced in the S.C. Senate and House in early 2018 and received near-unanimous support on both sides of the Assembly. The Coastal Conservation Association of South Carolina played played a key role in advocating the passage of the legislative changes. The new regulations will take effect on July 1, 2018. In addition to the legislative changes, SCDNR seeks to address increasing pressure on adult red drum by working with anglers to implement best handling practices. Valuable adult fish are highly susceptible to predators, disease, and exhaustion after release, making proper handling a matter of life or death. This entry was posted in Conservation, Saltwater Fishing on June 13, 2018 by ronniegarrison.